My husband Allen and I met and married while living in Florida. Allen, a fourth generation Floridian, a rare breed in it's own right, grew up there and is a Certified General Contractor. We owned and operated McInarnay Builders for several years. I grew up a "Navy brat" moving all over but home based off lovely Orr's Island, Maine. I've owned several businesses with my primary background in B2B outside sales and marketing. Most recently from 2003-2007 I had been a Machine Control Specialist for one of the largest US Trimble dealerships (GPS based grading technology) in Central Florida. We saw the small towns we knew and loved being destroyed by poorly planned growth, tourism and illegal aliens. Both of us have always lived near the ocean but vacationed often in the mountains. Enjoying the privacy and quiet of the great outdoors was always a priority. We knew we wanted to make the move before life's years paged by and it would be too late. However, we were not quite ready to retire or sure we even ever wanted to but, an accident changed our lives and accelerated the move several years before "planned". Rolling with the punches we closed up McInarnay Builders and sold our Florida home. We kept our faith in God's wisdom. 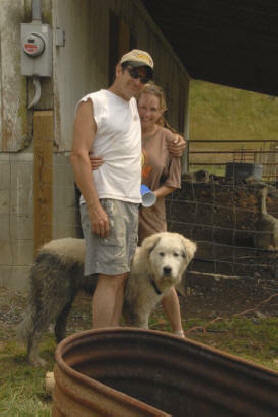 I moved in with my wonderful mother-in-law and kept my job out of necessity for a time and in November of 2005 Allen brought our pets to West Virginia with him till I could join them. When I finally left my job we moved a foundation herd of seven alpacas up in April of 2007 and put our future once again in God's hands. It's a good thing tending alpacas is fairly easy. Don't let the glamorous photo above fool you, pretty much, if you can tend cats and dogs you can tend alpacas. We definitely wanted to spend the next chapter of our lives doing something we love in a place we love surrounded by the critters we love. We never dreamed that it would be so soon yet here we are. And we are encouraged. We have had a tremendous interest in our ranch by the local community! Welcoming visitors are some of our favorite days, you never know who's coming next. We've had everyone; serious buyers and browsing alpaca shoppers, church groups, families on outings, fiber artisans in search of new spinning materials, and even curious local farmers just comin' up to scratch their heads at us. 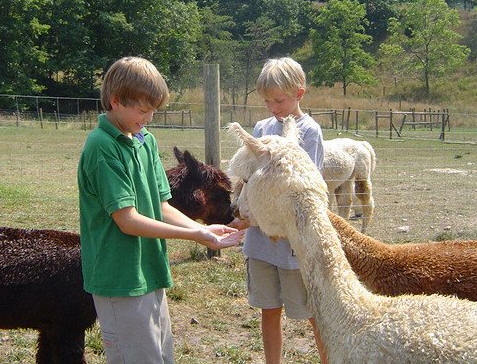 We enjoy educating everyone about alpacas and the alpaca lifestyle. National Alpaca farm and ranch weekends have been interesting and we try to participate every year. We've networked with other alpaca farmers in our area. We've been guest speaker's at the local Ruritan meetings and hope to get out and about to do more group presentations. We now have a trade association in the state. 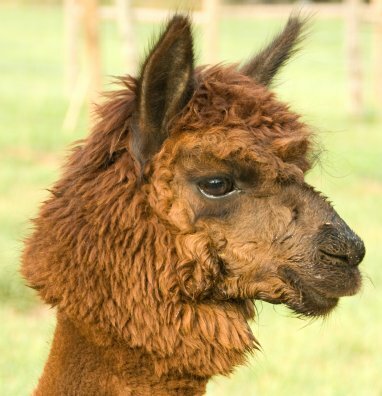 The WVAO (West Virginia Alpaca Organization) began shortly after we arrived and we're proud to be charter members. The word about Double "A" Ranch and our Double "A" Alpacas is definitely getting around. Now, if only we could figure a way to speed up that year long gestation period we'd have it made! What ever made you want to raise alpacas? We read everything we could find on the Internet. We spoke to experts, breeders, veterinarians, animal nutritionists, and read information by biologists and university professors. We researched marketing analysis, and economic forecasters. This experience gave us a true perspective and understanding of the animals and the business of raising them. We finally concluded that with careful planning and execution we could develop a five-year plan that safely minimized the 'downside' and realistically presented us (anyone) with a high probability of success - a wonderful lifestyle, positive cash flow, and substantial annual appreciation in herd value. After visiting a Christian conference in Flatwoods, West Virginia in April of 2004 we fell in love with mountainous pristine rural West Virginia. It fit the bill perfectly. Still east coast so that we weren't out of reach of family and friends, moderate climate yet a change of seasons, and the number one feature for us was an extremely sparse population. By October of that year we had decided to return for a long weekend "just to look around". Naturally, we bought the third place we looked at on our first expedition. We sold our beach house to fund our new spread, keeping our main residence in Merritt Island, FL. We were completely smitten with Monroe County and the near by town of Union with their population of just under 500. Back to our dilemma... How to earn a living? After research and talking with locals we quickly ruled out the traditional farm animals. They were raising Black Angus cattle on our place when we bought it and quickly learned that to make a go of it we'd have to have a couple hundred head. The last thing we are looking for is to become some big operation complete with employees and the roads we'd been down before. That's exactly the stress we're trying to avoid. Plus it's back breaking work, then we discovered Alpacas. I would take up the sales and marketing study of these animals, stay in Florida and keep my job temporarily. Allen would move to the ranch with our pets. (we could do a whole page on our pets we call our "kids"...maybe later.) The make up of the "crew" has changed somewhat since we've arrived. Today we have our Black Lab, Angus ; 17 chickens, five cats; Bob, Muffin, Danny, Sammy,& Petey and also our cantankerous 4' long 20 year old iguana named India. Allen would oversee the task of transforming a cattle ranch into a home suitable for us and the raising of alpacas. There is always plenty to do – and plenty of satisfaction to go along with it. Enjoying life with our alpacas. © 2005-2018, Double "A" Ranch, LLC All rights reserved. Reproduction in whole or in part without permission is prohibited.